Call today to book your amazing Indian Ocean Holiday. An Indian Ocean holiday is a holiday in paradise. The Indian Ocean washes up on southern Asia and separates Africa and Australia. Sovereign states are Maldives, Mauritius, Seychelles, Sri Lanka, Madagascar and Comoros. These islands lay like pearls in the warm waters of the crystal clear Indian Ocean . The Maldives is an island paradise where hundreds of small islands are scattered across the Indian Ocean, each surrounded by a turquoise lagoon that laps at pristine white sand. Stay in a water villa over the sea. Or try a beach bungalow, walk out your front door to the most magnificent view. A true paradise on earth. Sri Lanka is an island full of temples, enormous Buddha statues and ancient cities. There are wonderful beaches, plantations and parks, where elephants and leopards rove free. 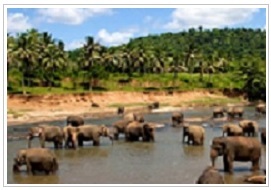 Sri Lanka is an ideal Indian Ocean Holiday for those who want to mix and relax on the beach with culture. Mauritius has fabulous hotels with unsurpassed service and food to match. Have a massage in a luxurious spa, play golf on magnificent courses or take a boat out to sea to catch a fish. Sit in a bar, relax and let the world pass you buy. An ideal Indian Ocean holiday for those who want top-class. The Seychelles consists of 115 islands and are some of the most beautiful you will ever see. With impressive granite boulders against amazing white sand, bright clear water and lush green plants. Remember to take a trip to see the loveable giant tortoises. An unspoilt island for you to enjoy. Madagascar floating off the southeast coast of Africa, is the fourth largest island in the world. Home to a multitude of plants and animals, a large number of which are solely found in Madagascar. With amazing beaches, awe inspiring scenery and excellent resorts, Madagascar is an irresistible and unique holiday destination. Any of these destinations are ideal for your Indian Ocean holiday.